And so began a day of powerful and diverse talks featuring men, women and some extra special youngsters – loosely grouped thematically as bridges that connect, bridges that divide, and bridges that we burn – on innovation, empowerment and brilliant ideas conveyed through the superb storytelling format that makes a TED talk. Antonia Romeo, Permanent Secretary at the Department for International Trade, made a strong case for mentors and inclusive leadership. She urged the audience to “dare to be great, leading by example can’t be delegated.” Natalie Reynolds, CEO of Advantage Spring, urged us to think more of collaborative competitiveness, and had the room arm wrestling to prove a point. 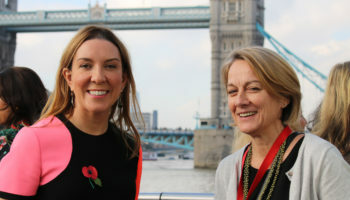 Claire Eadington, Senior Adviser at the Environment Agency, reminded people to face down their fears and acknowledge success “I looked over my shoulder and saw how far I had come.” While 10 year old – yes, TEN-YEAR-OLD – Noah Dance shared his idea for a terrific app. His mum looked on muttering that she was – of course – more nervous than him. Our Comms team was on hand to help run the social media and photography side of the event, but also to recognise and honour two extraordinary women through the annual Marsh Award for Peacemaking and Peacekeeping. The Marsh Award recognises outstanding people who have attended a Wilton Park event during the year. In 2017 Fareeda Abbas Rasho Khalaf (Yazda), was one of two recipients, recognised for her brilliant work supporting Yazidi women. 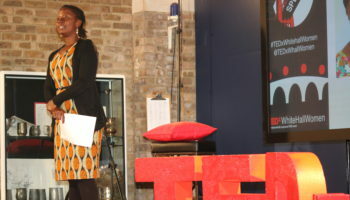 Our other award winner, Ugandan Angela Atim Lakor (Watye Ki Gen) had delivered one of the TEDx talks earlier in the day. Her extraordinary story about kidnap and daily torture for eight years as a ‘wife’ in the Lord’s Resistance Army, was rightly received in stunned silence and ended in a standing ovation. Both Fareeda and Angela had survived brutalising experiences while abducted and enslaved and both had somehow managed to turn that experience into a new life dedicated to supporting others and trying to ensure sexual violence against women is prevented. The word ‘inspiring’ can be over-used but the fortitude it takes to be able not just to survive but then to share such terrible experiences really merits the accolade ‘inspiring’. Their careers now focus on speaking out for others so they need not suffer in silence, to tackling stigma, and to protecting rights and responsibilities through civil society and through law. 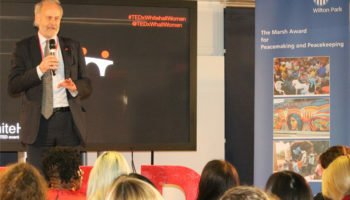 We were proud to have been able to play a small part in recognising and supporting their efforts and in partnering with TEDx Whitehall Women too. We too have our own role as a bridge. As Myles Wickstead, our Acting Chief Executive pointed out as he introduced the Marsh Awards, the ‘bridge’ is embodied in our logo. It’s a function of the dialogues for peace we have been holding for more than 70 years and long may we continue to do so.